Spring is officially here and many homeowners are thinking of projects that will not only clean and enhance the beauty of their property, but add value too. From exterior updates and additions to bathroom and kitchen remodels, there are several projects that will give you the biggest bang for your buck. Whether you’re making improvements to a recently purchased property or preparing to sell, it’s all about increasing your property’s value and these tips will help you in achieving that. Out dated bathrooms can stop a sale in its tracks. Even if you’re not looking to sell, it’s nice to feel like you’re living in the current decade. As you renovate, keep in mind the trends of today and if those trends will have lasting value in the future. By replacing outdated faucets, adding aerators, adding on-demand water heater, and installing water efficient toilets that save water can benefit you with energy savings immediately. A minor bathroom renovation typically includes new vanity doors, drawers and hardware; new lighting, new plumbing fixtures and new paint. Additional updates like new countertops, flooring and tub/shower tile can further increase the desirability of your property. The average cost to completely remodel a master bathroom is about $16,000. This price can be cut down to almost $8,000 for smaller bathrooms and is much less for a minor renovation. A minor kitchen remodel typically consists of replacing cabinet fronts with raised-panel wood doors and drawers, along with new hardware; replacing wall oven and cooktop with energy-efficient models; replacing laminate countertops; installing a mid-priced sink and faucet and repainting. Minor kitchen remodels can help an older property sell quicker and for more money. Most buyers are not interested in remodeling and are looking for updated kitchens and appliances. A major kitchen remodel can cost $55,00 or more and would be best if you plan to stay in the home and are remodeling for your use. If your property has unused attic space, consider turning into an additional bedroom or flex space. You’ll recoup even more of your investment if you can add a bathroom as well. With an additional bedroom and bathroom, your home moves up into the next level of comparable properties, usually meaning you can expect sell your home for quite a bit more. A new steel door may not sound like the best addition to your house, but it’s one of the financially savviest. Steel entry doors are constructed with thermal adhesives to increase structural integrity along with energy efficiency. Since steel doors will never warp or rot, they can keep the elements out of your home better than wood doors. According to Remodeling Magazine’s 2014 Cost V. Value report, homeowners who install a steel door can expect to recoup nearly 97% of the cost when the home sells. Replacing your garage door is another way to improve the exterior of your home. But while it’s typically inexpensive, an upgrade isn’t necessary unless your garage door is old, beat-up or a particularly visible part of your home. Many times, a new coat of paint and new decorative handles looks just as nice as a new door. Keep in mind curb appeal is very important in attracting buyers to your property. New windows look sharper, insulate a home better, save on energy and, for buyers, avoid the cost and hassle of doing upgrades. Wood is the preferred trim finish, but other replacement window projects also pay off. New windows keep extreme weather outside. Energy-efficient windows can reduce the demand on your heating and cooling system. “Low-e” (low thermal emissivity) windows have a very thin coating applied to the glass that reflects various solar waves. Combined with double- or triple-pane glass and argon or krypton gas, low-e coatings can significantly improve the thermal efficiency of your windows. Cement siding, also called Hardie board siding, is a low-maintenance, long-lasting material that holds up much better than wood siding in Florida’s heat and humidity. If your house has wood siding, cement siding offers a unparalleled quality being completely rot and insect resistant and it can even handle salt spray from the ocean. While cement siding is more expensive than wood or vinyl siding, it really holds up along our coastline and can sway a buyer when comparing two properties. Homebuilders, residential architects and landscape construction specialists are seeing more and more homeowners looking to include outdoor space in their home design. The American Institute of Architects’ second quarter 2017 Home Trends Design Survey reported requests for outdoor living increased for the sixth consecutive year. 70% percent of the 500 architecture firms surveyed reported an increase in requests for outdoor living from clients. 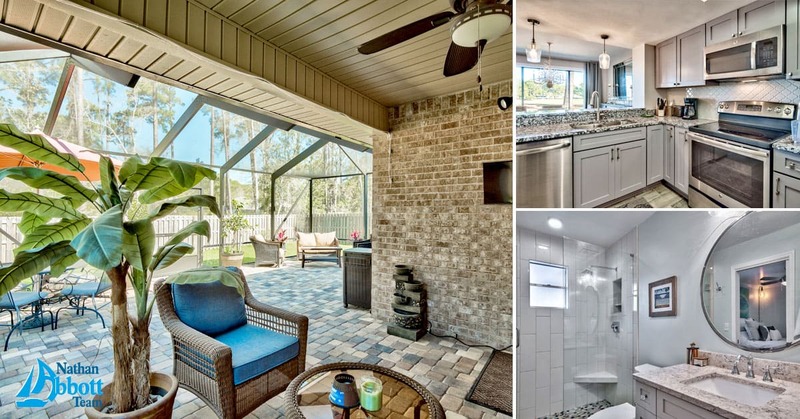 While the cost of your specific project will be the main factor to determine how much value is added to your property’s market value, many buyers choose properties based on their outdoor living spaces – especially in Florida where our weather is great year-round! Curious of what you may be able to sell your property for in today’s market or what buyers are looking for along the Emerald Coast? Contact The Nathan Abbott Team to connect with some of the Emerald Coast’s best agents to discuss your property’s potential value.